Categories: Storytelling, Creative Coding, Design, Fabrication. Role: Research, Content Architecture, Visual Design and Fabrication. In texere, digitally generated designs make up the patterns for a hand woven textile that highlights the commonly hidden context around spoken words. Inspired by traditional Folk Art and the use of language in Oral Societies, it’s about crafting unwritten forms of language as a way of preserving the human side of collective memory. Language shapes the way we see the world and the way we learn how to communicate and relate with each other. Technology doesn’t always capture the human side of language, and that is how things are said. And without it, language is being reduced to meaningless words. This project preserves the essence of the meaning behind being human in a world that is foreseen to become more and more automated. Since technology is not always designed to transmit empathy and we rely on computers to talk for us. Preserving daily social memory must now include not only the spoken words, but the context around it, represented mainly by the patterns of intonation, pitch, volume and pauses. Such characteristics are present in every language. 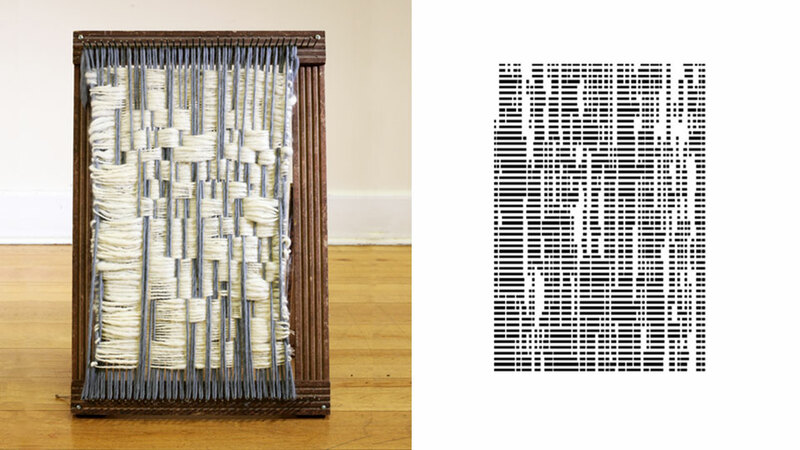 After performing audio analysis of oral histories collected, and gathering inspiration from traditional Folk Art and crafting techniques, a digital language pattern that translates the spoken words into weaving designs was generated. Finally, these designs became a physical weaving piece. While technology moves forward and the future seems to be more and more automated, new mediums for sharing real stories are appearing. The problem with them is that we are losing the unique capacity humans have to connect and share empathy with others, which is not being translated into technological mediums yet. And while this happens, texere tries to look back to old and traditional ways of sharing information and analyze what can we learn from them. This first piece tries to address language and identify which levels of it are we sacrificing with new tools, and how can we bring them back in favor of the storytelling experience, in the most human way possible. This project started with the idea of understanding what was the story behind how Folk Art became a traditional form of art that talked about the daily life of people. This exploration included understanding how people told and preserved their stories, what was special about crafting these experiences, and why they became traditional cultural expressions of those communities. The research analyzed Oral Societies and the way we recorded information when there was no writing, to better understand the natural way in which our brain process information. One example of this were Textiles, that have been important for the reconstruction of our history, because they have explored a language through symbols and figures that could make reference to the daily life of different cultures in the las thousand years. 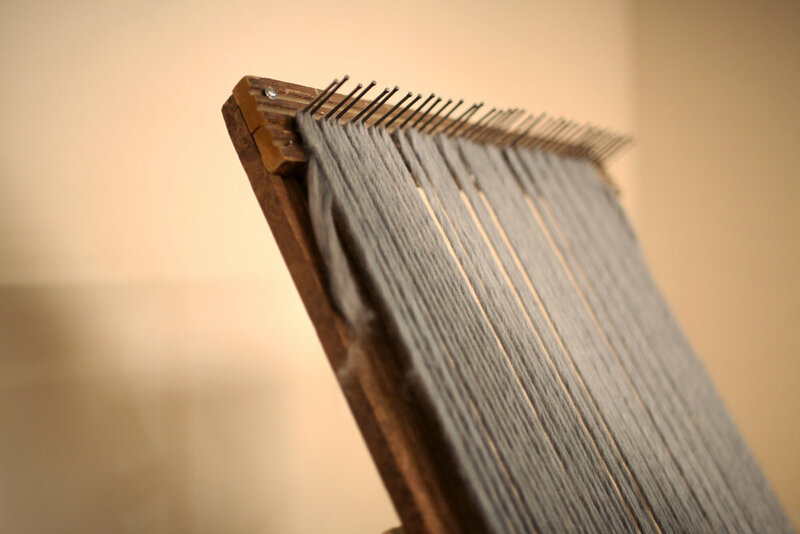 Knowing that the first computer was based on the logic of how a loom worked, using holes punched in cards to code data, information was weaved in the same way an artisan would weave a piece of textile. There’s a consistent logic in the way we process and produce information, that goes back to the old times when stories were crafted and patterns were emerging. And that’s how language became the connective tissue between the necessity of telling stories and preserving them. Throughout this exploration, I delved into practices from the past that we could bring to the present. I developed a voice recognition system that would identity pitch, tone, volume and pauses from oral histories collected. That analysis would turn values into design patterns that would make reference to the spoken context being analyzed. After that, a weaving piece was made. Elba Ambía, a Peruvian woman who moved to New York more than 50 years ago. Her first language is Quechua, a native language from the Andes. As an immigrant and someone who has called many places home, Elba spoke to me using language as her medium to keep connected to her community back home. This use of spoken language to connect to culture showed me a real world example of the power of Oral History. Telling stories about ourselves and what's around us is not just putting one word in front of another. There are many layers to how we tell stories and by understanding those layers, we are able to connect. In order to capture these layers, I developed my own tool and her story generated patterns that I weaved for my final piece. The Digital designs: To come up with the digital designs I needed to translate the information I needed, I had to test different options. I started with basic shapes (rectangles, circles, lines) that would be generated after analyzing audio. It was very interesting to see how from simplicity great designs can come up. It was after generating different options, that rectangles that identified pauses called my attention. I decided to work with them and generate patterns based on downloading pixels to the canvas. The loom: In this project, the loom used to create the final piece was designed inspired in the traditional way women in Latin America craft, turning weaving into a performative act of expression which I replicated. Some of the first iterations asking friends from differents countries and cultures to tell me a story about a trip they made. Each of them generated a different pattern.